Located about 6,500 feet above sea level, it is famous for its apples and acres of apple orchards offering marvellous walks through pine forests and orchards with great views of Hatu Peak, Narkanda Town, Kumarsain Village and the majestic Mount Shrikhand Kailash which are clearly visible from here. Kotgarh village was a station of the British army during the 1814-1816 (Gorkha war), it has a church built in 1872, the village has a few shops a hospital and a village market, a perfect place to experience, view and get a feel of the Himachali lifestyle. If you are looking for a peaceful retreat in an exotic far away location then Mr. & Mrs. Minhas’s cottage in Kotgarh is an ideal get away for city dwellers who want to spend some quality time with their families in the hills. Around the cottage are many short distance explorations areas and scenic spots. Mountain Lake Tani Jubbar: The lake is at a distance of approximately 4 kilometres from the cottage, the lake is quite serene and has a lot of small forest trails to be explored its an ideal picnic spot to unwind and enjoy the day, near the lake there is a flat ground where every year in the month of June, a fair is held to welcome the village Devta Famous for ‘Nag Devta’ temple. Hatu Peak: At 11,000 ft, this peak offers a panoramic view of the snowline. Hatu hillock provides beautiful and majestic views of the Himalayas and the surrounding pahari hamlets. It also has a small Kali temple. For almost six months in a year (winter and spring), Hatu is covered with a thick blanket of snow there is a motor able road right which goes all the way till the peak. The Trek approximately takes 2 hours and it takes you through a dense forest of Pine and Spruce trees. There is a Gujjar hut en route where one can break journey and enjoy the surroundings. Sadhu Sundar Singhs Cave: Sadhu Sundar Singh was a Sikh Indian christian missionary who is believed to have spent some years in kotgarh devoting his life to spiritual practice, he took shelter in the caves found in Kotgarh, the Trek to the cave is a soft one but yet quite adventurous. Melan Village: Melan village is 15 mins downhill walk from the cottage, walking through this village trail gives you a real impression of the Himachali local life where the old traditions and cultures are still part of their daily routine lives. There is a Temple in the middle of the village where one can stop to offer prayers.The Hhimachali people are very friendly, curious and more than happy to answers questions and be photographed. You can enjoy a cup of tea with the locals as well. The trail further leads down into the forest (Melan Dhak) where a seasonal stream flows and turns into a waterfall after a short walk. Saint Mary's Church : Built in 1872, the church, it stands out as an example of the Gothic architecture. The church is located in the middle of the town and has magnificent view which enhance the settings of what is one of the historic buildings of early mission work. 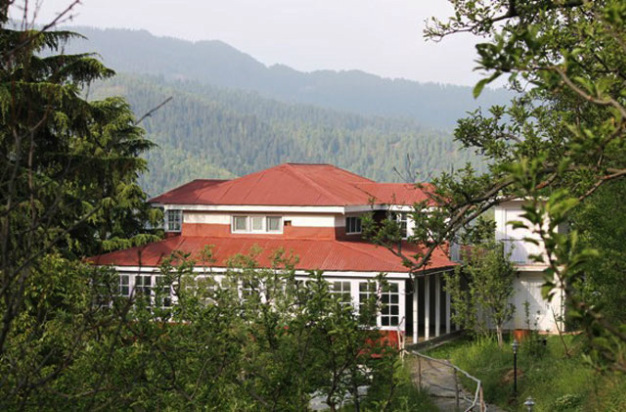 Along side the church, a school operates, and the school is named after Gorton, a distinguished servant in Simla. 4 x Double Bedrooms, Living room, Dining room and Tea/Coffee balcony. The cottage consists of a total of 4 bedrooms out of which two bedrooms are on the ground floor while the remaining two are on the first floor. The ground floor rooms are comparatively bigger in size as compared to first floor rooms. The living room and the dining area is on the ground floor. The first floor rooms have an independent coffee/tea balcony. As the cottage is a heritage building and keeping with the tradition of the times when it was built, the bathrooms are therefore, located outside the main cottage, a mere 10 feet away, connected by a covered path. Extra bed charges are Rs. 2,500 with Breakfast, Lunch and Dinner.